Cameron Gaunce admits it had been a while since he’d been on an NHL rink during the regular season before he made his Dallas Stars debut on Dec. 17 against the Colorado Avalanche at American Airlines Center, nearly three years. Gaunce, 23, who was acquired in a trade with Colorado last spring that sent ex-Stars forward Tomas Vincour to the Avalanche, had appeared in 28 games for the Texas Stars of the American Hockey League when on Dec. 16 he got the call every young player at the AHL level waits for, that he was headed to the NHL. "Yeah, actually I was just about to go to bed. My girlfriend and I had gone to the movies that night. We didn’t follow the (Stars) game. When I was in Texas I tried to stay with Texas, tried to keep myself there mentally and physically and really put all my care and thought into that team, so I wasn’t really following Dallas at the time," Gaunce said of the circumstances surrounding him learning he was headed to Dallas. "So when I got the call from (Texas Stars GM Scott) White, I wasn’t really sure what was happening, whether it was a good or bad thing getting a call that late at night. So I answered phone kind of hesitantly, but it was a very nice surprise and I am very thankful for the opportunity," he said. Thus far, he has appeared in three games for the Stars and has five hits, one blocked shot and is plus-4, solid numbers for the young d-man. And since it was Colorado who drafted him in the second round of the 2008 NHL Entry Draft and it was the Avalanche who he made his NHL debut with in the 2010-11 season, there was something extra special about facing the Avs in his Dallas debut. "It was a special night. Never really was expecting it because I didn’t know (coming up here was a possibility)," Gaunce admitted. "I wasn’t following the game, so it was a nice Christmas surprise I guess. (I’ve) been trying to take full advantage of it since I’ve been here." With the rash of injuries to the Dallas rearguard, including Stephane Robidas, who will likely miss the rest of the regular season with a leg fracture, Trevor Daley, out for the past several weeks with a lower-body injury suffered in a game in his hometown of Toronto and now the status of fellow veteran blue liner Sergei Gonchar apparently up in the air after he took a puck to the face and had the leave the ice during a shootout loss to San Jose on Saturday night at HP Pavilion, the Stars need to be able to call on young d-men like Gaunce and thus far he hasn’t disappointed. "Well, he’s a guy that plays the game on his toes. He’s aware of his coverage, his reads. 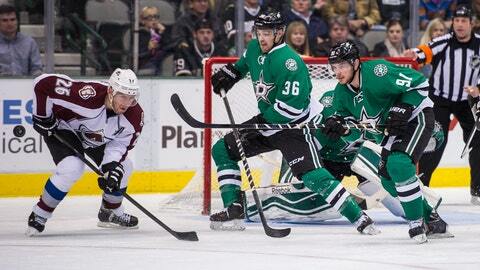 He’s been able to move the puck quickly," Stars head coach Lindy Ruff said. "That first pass coming out of the zone has been good. His gap on the opposition is right where you need it. When he’s going back for pucks, he’s going back quick and he’s making good decisions." Gaunce credits Ruff and new Stars assistant coach James Patrick, who like Ruff is a former NHL defenseman, for making it very clear what they expect from him in terms of how they expect him to help the club by keeping things simple and not trying to do too much. After learning he had been recalled the night before and taking an early flight to Dallas the morning of Dec. 17, he had an individual skate with Patrick while his new teammates had the morning off since they had played in Colorado the night before. That session, although fairly short, has worked wonders for Gaunce’s confidence in his early time with the Stars. "I think it’s important for me to minimize opportunities for the other team because I’m here just to play a simple game," Gaunce said. "So I think the less I’m in my own zone, the better it will be. They don’t want me to be going in there with the puck, so the first opportunity I see I try to get back to the puck fast and just get it up." Of course, he has been staying in game shape by playing in the AHL over the past few seasons, but he has been playing the game long enough to know that every player coming up from the minors notices several big differences between the AHL and NHL game. "The speed is a lot different than in the American Hockey League and how smart the guys are you’re playing against. They know their systems down to a tee, so you really need to make sure that you’re focused and on top of it right away," Gaunce said. He also credits his new teammates, especially those like Alex Goligoski and Gonchar, two guys who have been in the league for a while and who have plenty of sage advice to offer an inexperienced defenseman like himself. Gaunce has been paired alongside fellow Stars newcomer Kevin Connauton, who himself was acquired a spring trade with the Vancouver Canucks that sent Derek Roy to British Columbia. But at least early on, this youthful pairing hasn’t shown any signs of being rattled or making an alarming number of rookie mistakes. And the man known as "Goose" who has seen his ice time raise considerably in the absence of both Robidas and Daley and could see it raise further with Gonchar also possibly going on the shelf echoes the sentiments of his new head coach in saying that he likes what he has seen from his new teammate thus far. "He’s been great, been real solid. He doesn’t look uncomfortable at all out there," Goligoski said. "He’s jumped right in stride. He’s played aggressive. That’s the way we want to play, so he’s been good." Gaunce naturally said he’d like to stick in Dallas on a long-term basis but realizes that is at least somewhat out of his hands. But in a year where the Stars have been plagued by a rash of injuries at the blue line, his poise and solid early performances can only help his chances of sticking in the NHL at a time when his club needs plenty of bodies on D.